This guide is designed to aid users through the completion of their first time study, or refresh users on how to properly complete a time study. The guide can also be downloaded as a PDF here. Look at your current operations to find processes or procedures that might not be working perfectly or where production might be improved or costs lowered. Identify the equipment, location, stand factors, objectives, and other general descriptions of the proposed study. For instance, I want to study a harvester in smaller diameter KZN Eucalyptus plantations – flat topography, to better understand debarking productivity. How much time might we save by doing 3 passes instead of 5 debarking passes? Visit the Select Objective page on this website and follow the decision tree questions – The end result here will be a proposed “study type” and “experimental design”. Links are provided to the Time Study Standards page that have detailed descriptions and examples on how to set up your study. Using these guides, design your study to collect the correct data so they can be used to meet your study objective and allow for appropriate statistical analyses. Failure to design your study up front often leads to wasted effort and investment in irreverent or unnecessary data collection. 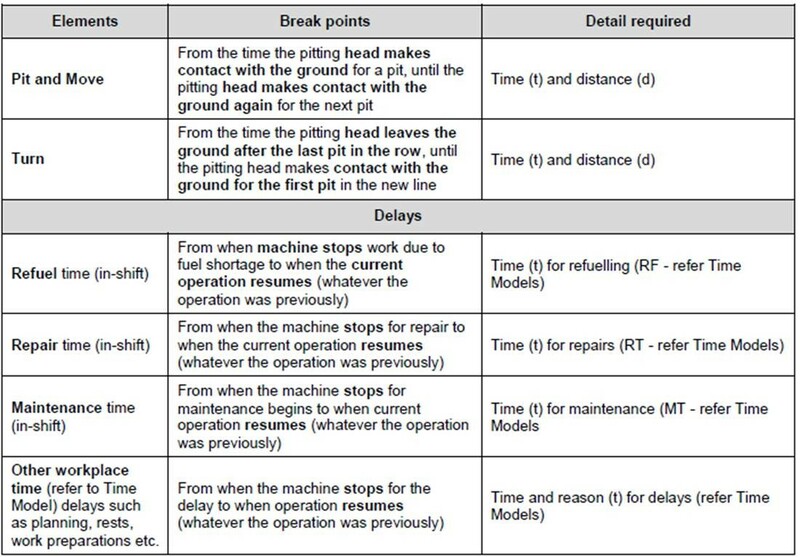 Also look up the equipment/operation specific time study elements that will need to be timed or measured available here. These are also located in the Time Study Standards in section 5.0. Measuring equipment: Callipers (digital or manual), vertex (or other simple hypsometers – Suuntu) and tape measure or logging tape. A GPS is another useful tool for truck distance measurement, particularly when longer distances are being studied. For measuring methodology refer to South African Forestry Handbook (2012 & 2000). Background information sheets have been developed and are available available for download (PDF and Excel) for filling out and use in the field. Locate these forms here. The top section of these sheets will be used to record general information such as name, company, dates, etc. Additional sections have space to record stand and site factors, equipment information, operating factors, and additional information/notes about your study. It is imperative that this information is accurate and complete. These data sheets will provide future database users the relevant study details so they can find datasets of interest. For instance, some users may only be interested in studies focusing on Eucalyptus. Without the background information included on these sheets, users will not be able to filter the data set to find the appropriate studies. This app can be downloaded from the Time Study App page. Users must enter their email address in order to start the download. Your email will be used to contact you with any updates to the app. You will download a file titled “timer-v1.0.0.0.apk”, open this file from your Android device to install the application. The installed application will be titled “Forestry TimeStudy”, with the android icon. A step by step video of the installation process is available on the Time Study App Tutorials page to help show you how to do this. Collection and recording of additional data regarding specific site and tree information is not covered on the background info sheets or in the Time Study App, and will need to be done prior to starting the time study. Quantities and rates such as pump rate (L/hour) and fluid quantities. Measuring equipment and measuring methodology are listed including references to the South African Forestry Handbook. Data collected on Android devices using the Time Study App can be easily downloaded into Excel on any computer. Study Data can be exported/shared directly from the app to many different cloud storage spaces, emails, messages, etc. If your android device does not have access to internet, this data can also be exported manually. To manually download data, first plug the Android device into the computer using a USB connector, open device folder on the computer, and search for “Timer” on the device. A folder should appear titled “Timer”, which can be opened to view all collected datasets, in Excel format. File naming is as follows: Activity/process_date_time. For example, a file could have the title “auger_13-2-2017_3-48-42.csv”. This data is not in an appropriate format for easy data analysis and must be organized before submitting to the database. Reorganization of the data can be easily completed using pivot tables and vlookup functions in excel. A step by step video that goes through this process is available on the Time Study App Tutorials page. An electronic background information form has also been developed for use when submitting background information. This form can be located on the Background Information page. It will ask for the same content as the in-field background information sheets but can be used for submitting information for both harvesting and silviculture operations. All data should be submitted to forestproductivityza@gmail.com in a properly processed excel file. Need help planning or executing your study? Fill in this electronic form to let us know what you need help with and we will do our best to assist you.